From Faith: A little chopping, a sheet pan and an oven are all you need to turn out this glorious taste treat for Thanksgiving or, in my case, for any occasion. Our show volunteer, Marian Roy, dropped this one on us and after tasting it, Chris Prosperi started making it for his customers at Metro Bis restaurant. None of us can believe how easy this is to do, and how good it is. Picture crispy bits of roasted Brussels Sprouts, shallots, garlic and, if you like, prosciutto, tossed into a roasting pan with sliced pears and olive oil. Serve it and watch it disappear, if it even makes it to the table! Halve each Brussels Sprout, slice your favorite pears, mince peeled garlic, chop peeled shallots, chop prosciutto (if using.) Set aside. Pour 2 or 3 generous glugs of olive oil into the bottom of a roasting pan or baking dish. Toss in the chopped ingredients. Salt to taste. Stir to coat everything well with the oil. Roast for about 30 minutes, or until shallots are brown and crispy. Every oven is different so start checking after 20 minutes of cooking. Serve hot or at room temperature. Didn’t have pears this evening so used apples and they were sweet and delicious. Can’t wait to try the make ahead Turkey Gravey. Anything to make my life easier on Thanksgiving. 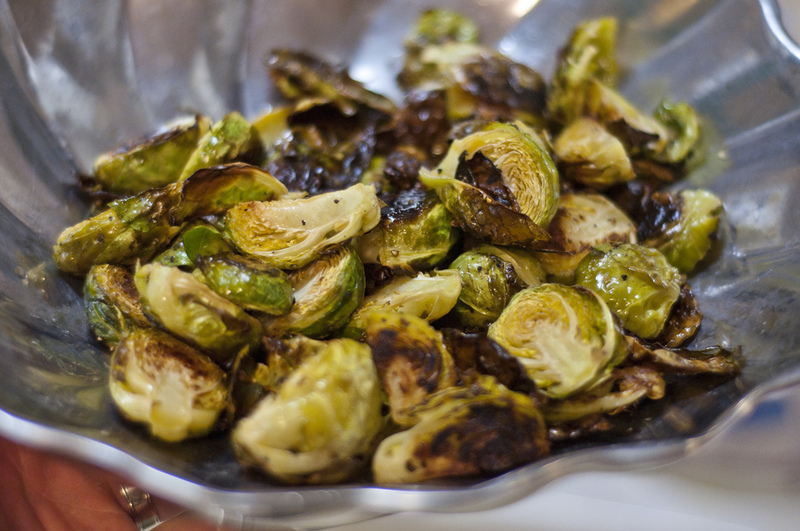 Brussel Sprouts sound wonderful also, can’t wait to make them. Mary Lou, the make ahead gravy from Chris Prosperi is absolutely terrific, and the way he uses Ina Garten’s trick with the gravy is truly a stress-free and delicious way to go. We did it in the studio and loved it. Shortly we’ll post a quick video lesson showing you how so stay tuned here and on Facebook at Faith Middleton Food Schmooze! If you “like” us on Facebook, we’ll send you our Hot Tip Feed. After hearing you talk about this recipe on your show I looked it up and cooked it tonight. After 35 minutes at 400 the Brussel sprouts were still under cooked. Next time I will pre-cook the sprouts and add 3 pears instead of 2. Other than those 2 things, it tasted really good. Love the salty savory vegetable with the sweetness of the pear. Used a firm pear and it cooked up beautiful, kept its shape but was still soft. A nice contrast to the crispy sprouts. A keeper. Not only did I substitute the pear for an apple but also onion for shallot and chopped keilbasa for the prosciutto… It was fabulous. So glad I didn’t have to share it! I made this tonight and enjoyed it. I think you can get away with using a LOT of brussels sprouts and a lot less prosciutto. I think it’s important to have a really big, heavy gauge roasting pan for stuff like this to cook evenly and not burn. How much does one package of Brussels sprouts weigh? Or at least please give volume if you prefer. They are sold loose in my local grocery. I don’t mean to be negative. Love your show. No worries. I made the recipe for Christmas dinner before reading your reply and pretty much came up with the same method you described. It was such a big hit that my daughter requested the recipe. So happy to hear that, Sara. Happy New Year to all. I love listening to you and your foody friends/guests! My new daughter-in-law loves Brussels Sprouts so I will definitely make these for Thanksgiving if not before. My mother, the best cook I ever knew, rarely used a recipe. I learned from watching her so I am used to working with recipes by “feel”. Most of the time it works out just fine. Thanks for what you do! I don’t get to listen all the time, but I love the show! I decided last year that I don’t like brussel sprout. My friend convinced me to give it another try, as I love cabbage. It turned out that I don’t like cleaning them up! I got a stalk of organic one, and cleaning them took a while. But the dish was delicious, and my husband pretty much ate the whole thing for lunch! Also I convinced my mother-in-law to cook the turkey in advance as you talked about. It’s always so stressful, and this way, she gets to enjoy the family better this year! Miyako, I bow my head to you in happiness — that we gave you a moment of pleasure. Hope the turkey works well to ease your mother-in-law’s stress. It has made things so much easier during my family’s preparation. 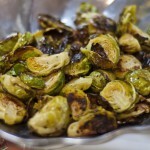 these sprouts are absolutely super I made them last thanksgiving and again this year and in between times as well. Who ever came up with this idea deserves a gold star. PS I added a rasher of cooked, chopped up, bacon ( bacon purchased from butcher–not store packaged) . Gave the dish a little something extra. You might gather that I love bacon, yet have never tried the bsprouts that way. I will soon thanks to you. Thanks so much for this recipe! This has become a regular at our house; it goes well with several types of entrees, from pork chops to Beef Provencale. It’s a keeper!